It would be interesting more generally for Durham families - probably not something I'm going to take on, but there are people out there who are seriously into genealogy, and I have a hope that landscape history could link to their online family tree-style work and vice-versa. I get relatively regular emails from people who have found some connection with their own family or are looking for more information about where their family lived. Now that you mention it, I have a partial genealogy of some Durham families from a project I was working on a while back. Yes, the major families - especially those who settled here early on - itermarried a whole lot. They're all related to each other, sometimes in multiple ways, and very often they wind up being their own third cousins or something screwy like that. I'll see what I can work out for the Carr/Duke/Watts thicket and get back to you. Both the Lyon and Watts Houses were home to the Calvert Method School until the campus at Chapel Hill Road and 751 (Academy Road) was built in the mid 60's. I attended the now Durham Academy on Academy in 1968 and it had been occupied for several years by then. The High School on Pickett and Ridge was not built until the mid 70's. Just got back the HPSD luncheon on Leigh Farm / Lowes Grove. It was fantastic! Any chance of seeing photos over here? I drove by LG for a few years until they demolished it last fall; was sorry to see it go. Indeed, a good Lunch & Learn today. How amazing to find this site. I attended the Calvert School from 1951 to 1961 at the Duke St. campus. I now live in San Francisco, but I have been by where the school had been a couple of times and wondered what happened to it. What I can add to your great information is that the school took over what you call the Lyon House probably around 1958 or so to accomodate expansion to the 7th and 8th grade levels. I was in the first class of each of these. There was also a modern kindergarten building constructed between the two houses in the mid 50's, and a small auditorium behind and to the right of the original school building as you face it from the front. Thanks so much for concocting this treasure. I attended Calvert Method and DA from 1958 through 1964. First in the old house, then in the Lyons House, which was great fun. In home room, we were in the basement with pipes on the ceiling we could swing from. In French Class upstairs, we would distract the teacher while Reid Bogdanoff climbed out a window onto a porch. The teacher would cry. A great school experience! UNC Morehead Scholar, and Yale PhD, and I learned everything I needed on Duke Street. Speaking at the DA class of 08 graduation. Unbelievable--I had seen the distant photos of the old Watts residence but never a close-up before now. Another amazing house, and the Lyon residence too, even if not quite as fantastic--fallen to the city wrecking ball. It's wrenching how many times this was repeated. But what would possess the school to abandon them in the first place, I wonder? Did the property have no value at the time? I'm sure the buildings were suffering from hard use and deferred maintenance, but it just seems ridiculous that they were left to vandals and vagrants. Just astonishing. Private schools are difficult to pin down on this subject many times, as they frequently didn't publish any announcement or make news coverage if a lone African-American student was admitted. From a superficial knowledge - (I emailed folks at Durham Academy, twice, asking for assistance with their history, but they never responded to me.) - I would guess, based on photos I've seen, that Durham Academy was all white until the 1960s at the earliest, perhaps much later, but I'm happy to be enlightened/corrected on this. I see the last comment on this post was over a year ago, but I do have some information about some of the questions/comments. I attended Durham Academy in the 1960s and 1970s. DA was actually officially integrated well in advance of the public schools, though it never had very many african american students in the 1960s. I started in the fall of 1964 and the school was integrated at that point. We were in the modern kindergarten building for the first year and a half that I was there, and then moved to the Academy Road campus when it opened in the middle of the school year in the early 1966. They didn't add grades 10-12 and the high school campus until the early 1970s. It was a real pleasure to see the photo of the playground at the Duke St. site since I remember playing there in the early 60s, about when that photo was taken. They even moved that merry-go-round to the Academy Road campus when the school left Duke St.
Eugene Morehead and George Watts were pioneers in the area that would become Morehead Hill when they built their houses on the western side of Lee (later Duke) St. in 1880. As the activity in the neighborhood increased, WT Blackwell sought to purchase the land on the eastern side of Duke St., directly across from their houses, to build worker housing for employees of Blackwell's Durham Tobacco Co. Evidently this was too close to the common folk for Watts, who purchased the land to avert this sale. 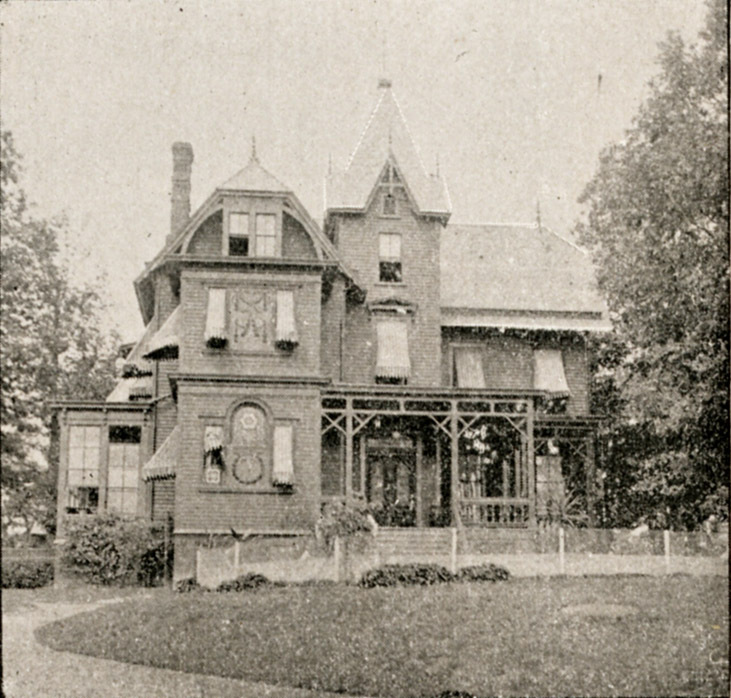 The George Watts house was originally built by George W. Watts in 1890, at the northwest corner of Lee St. (now South Duke) and Proctor St. 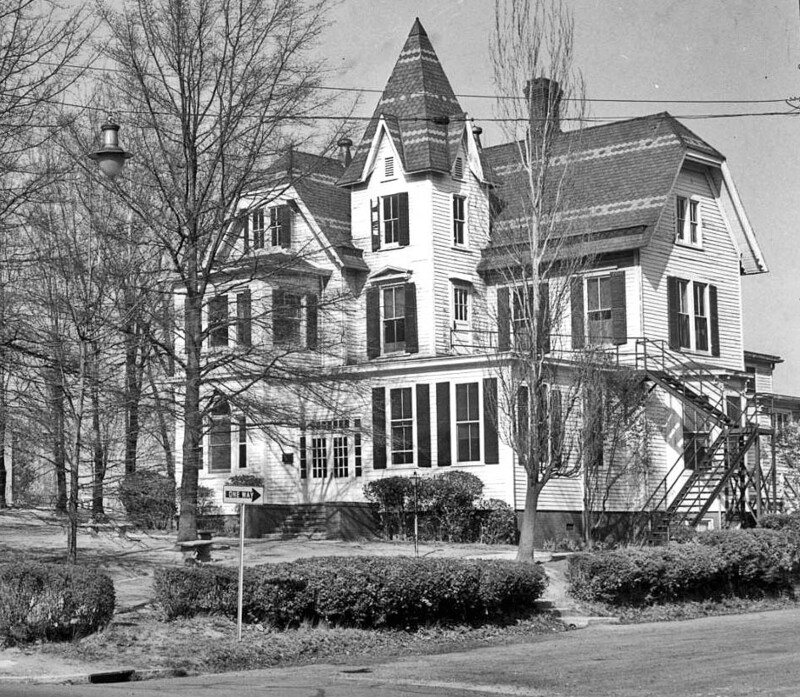 In the late 1890s, George Watts moved his original house across the street, to the northeast corner of West Proctor and S. Duke, in order to make way for his larger mansion, Harwood Hall. 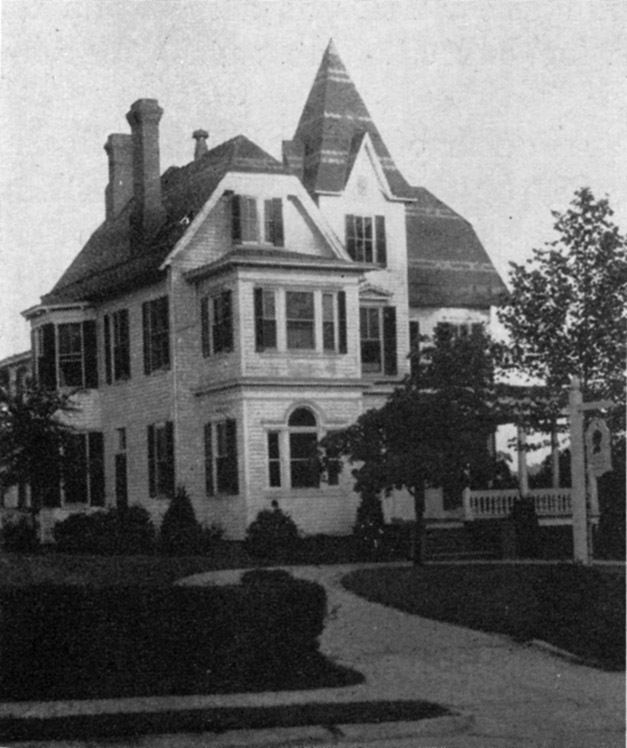 The house was renovated and used by John Sprunt Hill and his wife Annie when they returned to Durham from New York in 1903, before they built their own house in 1911. The use of the old George Watts house from 1911 to 1937 is unknown, but it evidently stayed in the family. By the 1930s George Watts Hill, Sr., and his wife Ann and were disappointed by the quality of the education George Watts Hill, Jr. was receiving at Morehead Hill Elementary - per Watts Hill, Sr., the only thing his son had learned to do at Morehead Elementary "[was] to 'cuss'." Ann Hill's family was replete with teachers, and she tapped their information for another solution. This pointed her towards the Calvert School of Baltimore, which had been founded by an educator named Virgil Mores Hillyer. Hillyer had designed a homeschooling program for children of parents living outside of the county, and thus without access to US schools. He had produced an entire curriculum, including books and supplies. In the summer of 1933, Ann Hill and the mothers of six other children arranged for the use of the Forest Hills clubhouse, which had bought by her father-in-law along with the old golf course 3 years prior, for the school, which they called the Calvert Method School. They began with a single teacher and slowly grew. 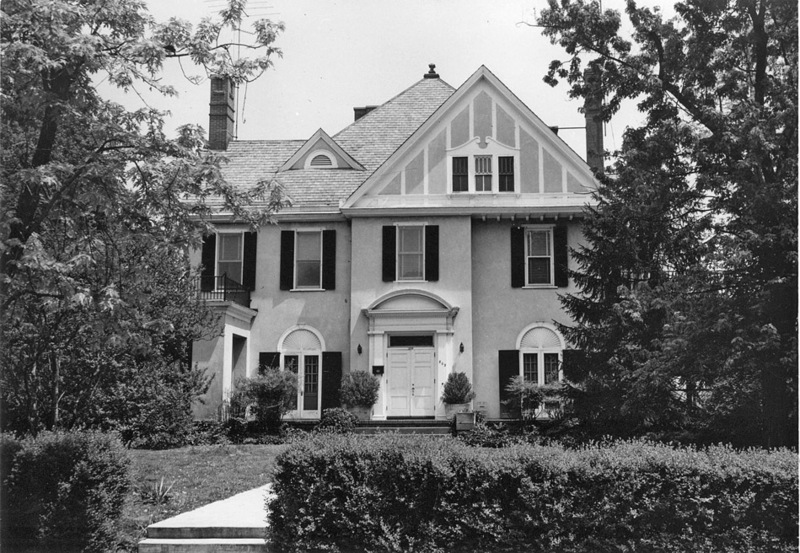 By 1937, they had outgrown the Forest Hills Clubhouse with 19 students; George and Ann Watts arranged for the school to take over the old George Watts house at 815 S. Duke; Watts Hill set up a $15,000 mortgage for the school through Durham Bank and Trust and paid for a $9000 renovation of the house. The school had grown to 210 students by 1950 and 16 teachers. 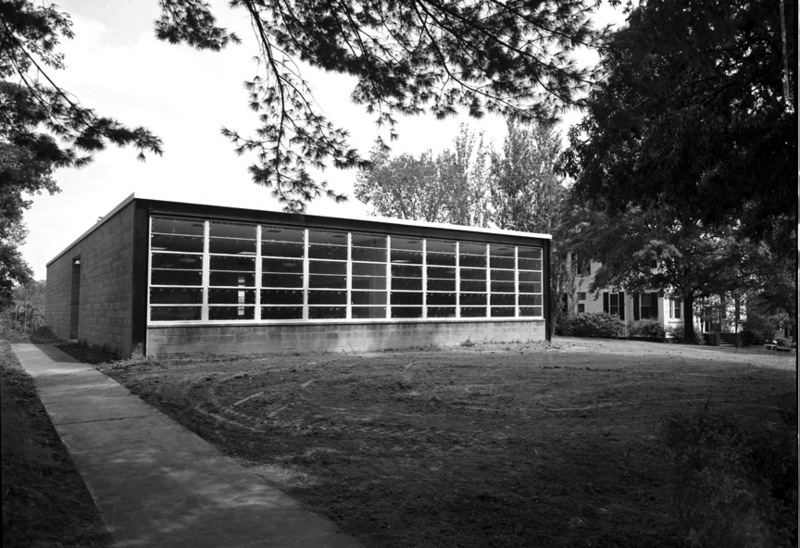 The school purchased the Lyon house (also known as the Williams house) in 1957, and constructed a modern kindergarten building between the two structures. In 1967, the school moved out to 751 (the eponymous Academy Rd.) and expanded to a high school, changing its name to Durham Academy. These houses / buildings were abandoned. The old Watts house, abandoned, early 1970s. The house was demolished by Durham in the mid-1970s to construct public housing - the JJ Henderson towers. I posted my feelings about high-rise public housing for elderly and disabled awhile ago when there was a fire in this structure, here. Namely, I think it is a bad thing - disempowering of both groups. I wish I would see folks who live in this building be able to make it one long block down the hill to American Tobacco, which seems a much more convivial environment than this stark grey slab.